Make s'mores for a crowd any time of year! 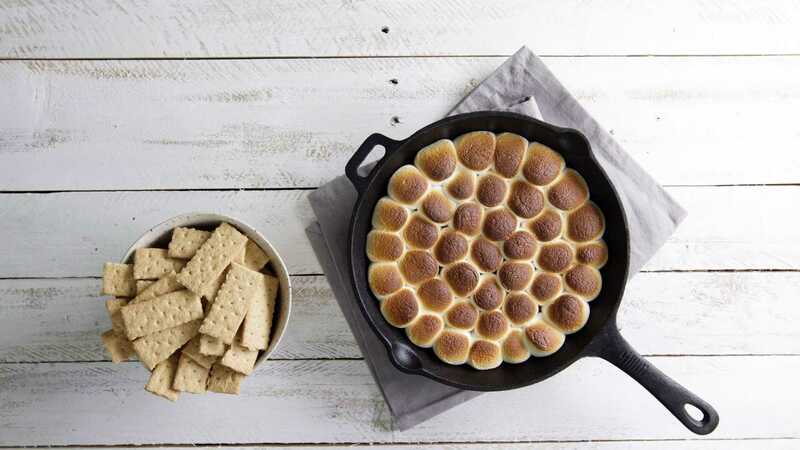 Using a skillet, all you need are the essential ingredients for classic s'mores to make a warm, bubbly and ooey gooey chocolate-marshmallow treat. S'mores aren't just for enjoying around the campfire anymore! The components of this classic dessert never go out of style--who could get tired of gooey marshmallows, melted chocolate, and crunchy graham crackers? These flavors are good on their own, but are even more fun when you turn them into other candies, like truffles, fudge, bark, and more! S'mores Truffles are one of the easiest ways to s'more-ify a dessert. Just add a miniature marshmallow in the center of a truffle, and roll the whole thing in chocolate. Simple? Of course. Totally delicious? Oh yes! Follow the arrow to the next slide to see more s'mores candy recipes! These amazing doughnuts are made with a simple marshmallow filling, chocolate glaze, and graham cracker crumbs—all of the ingredients that go into everyone's favorite s'mores treat. The deep-fried doughnuts are made with an easy yeast dough and the filling is piped into the cooled doughnuts. (c) 2014 Elizabeth LaBau, licensed to About.com, Inc.
Chocolate bark is my secret weapon when I have a powerful dessert craving and want instant gratification. This S'mores Bark is fast and easy to whip up, but no one will mind the simplicity when they're chowing down on this mix of smooth chocolate, fluffy marshmallows, and crunchy graham bits! Calling all s'mores lovers! S'mores Toffee features graham crackers covered with a simple toffee, smothered in chocolate and topped with marshmallows. The classic s’mores flavors get a boost from crunchy, buttery toffee. This easy recipe makes a big batch of S’mores Toffee Bark, so you’ll have plenty to share with friends and family. S'mores Treats are a fun, kid-friendly twist on rice crispy treats! Instead of crispy rice cereal, this recipe uses graham cereal, marshmallows, and plenty of chocolate chips. Cut the bars into small pieces and enjoy the delicious s'mores taste--no campfire required. Get this—7 ingredients, 5 minutes, and 1 amazing fudge! All you need is a microwave and a bowl to make this smooth and creamy S'mores Fudge. Try the basic recipe, then try adding in other mix-ins to make the recipe your own! Yes, you're not stuck with boring vanilla marshmallows when making s'mores! Cruise the candy aisle and pick up a package of Peeps to try this fun seasonal variation! (Not Easter time? Don't fret! Peeps seem to be available for practically every major holiday, and some minor ones, too.) These can be made in the microwave, so you're only a few minutes away from total marshmallow-chocolate bliss. Time to indulge in your campfire dreams and there's no need for a fire or to even be outside! This Boozy S'mores Milkshake recipe can be enjoyed anywhere and is filled with all the delicious flavors found in a gooey S'mores. It's simply served in a glass and is definitely for adults only.